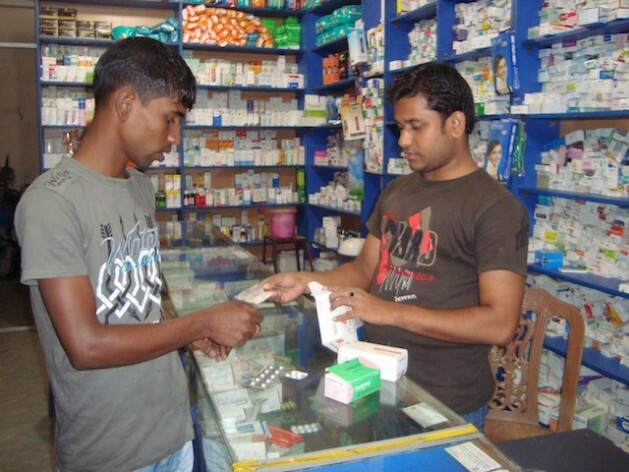 DHAKA, Nov 18 2012 (IPS) - Bangladesh has begun to shed its image as one of the world’s poorest nations and make a reputation for itself as a major exporter of cheap generic drugs to over 85 countries. Listed by the United Nations as one of the least developed countries (LDCs), Bangladesh has exported drugs worth roughly 50 million dollars since 2011. While this is admittedly just a fraction of the 170-billion-dollar global generic drug market, recent trends indicate that this South Asian country, home to over 150 million people, is poised to capture a larger slice of the market if it plays its cards right. Competition for production of quality generics began in 1982, when the Drug Control Ordinance encouraged expansion in domestic production. Following the exit of major multinational producers, local companies rushed to establish internationally recognised good manufacturing practices (GMP) and local investors were encouraged to join the flourishing market. Local manufacturing giants like Square, Incepta Pharmaceuticals, Beximco and a host of others emerged within a very short period of time. “Our (share) of exports is still far too small, but growth patterns suggest we will soon overtake other major export sectors” such as garments, jute and tea, according to BAPI Vice President Momenul Haq. Cheaper prices also make drugs produced here an attractive product, he told IPS. Out of a total of about 200 active local drug manufacturers, the top twenty companies have been exporting the lion’s share of drugs – about 85 percent – since the middle of the 1990s. The boom in exports did not, however, accelerate until 2005 when the country’s original 1982 drug policy was revised. The new programme, recognising that the industry already answered 97 percent of local demand, gave top priority to exports, which resulted in a decade of sharp growth. In 2001 only a handful of generic drugs, with sales amounting to 3.7 million dollars, were exported to just 17 neighbouring countries; today more than 300 generics are exported to 87 countries, with sales topping 50.4 million dollars in 2011. According to the Exports Promotion Bureau, some of the major beneficiaries in 2011 were manufacturers like Novartis Bangladesh, which exported drugs worth 10.8 million dollars; Beximco, whose sales receipts amounted to 9.6 million dollars and Square, which sold 7.8 million dollars worth of medicines abroad. Out of about 1,800 generics or molecules manufactured in the country some 300 varieties are now exported, mostly antibiotics, analgesics, contraceptives, stimulants, vitamins, dietary supplements and non-conventional herbal and Ayurvedic medicines. Destination countries for these drugs include Saudi Arabia, Yemen, Kenya, Malaysia, Bhutan, Azerbaijan, Honduras and Mexico, among many others. Strict tax codes ensure that a significant portion of these profits circle back into the local economy, which could boost Bangladesh’s efforts to graduate from LDC to middle-income economy status. Already foreign loan dependency has fallen from 85 percent in the early 1980s to about two percent in 2012. Per capital income has increased from less than 400 dollars in 2001 to 650 dollars in 2010. A thriving export market could boost growth even further, experts say. The domestic drug consumption market was worth 958.8 million dollars in 2010 and is expected to rise by at least ten percent every year, due largely to the expansion of quality healthcare services and increasing purchasing capacity. But the road ahead is not without its share of obstacles. Zafrullah Chowdhury, widely acknowledged as the leading expert on pharmaceutical policy in Bangladesh and a key player in formulating the 1982 Drug Ordinance, told IPS, “It is time we started making raw or active ingredients, because after World Trade Organisation (WTO) patent exemptions expire in 2016” Bangladesh may not be able to produce generic medicines as easily as it does now. According to the WTO’s agreement on the trade-related aspects of intellectual property rights (TRIPS), Bangladesh, along with other LDCs, is excused from patent regulations until 2016. However, when they kick in four years from now, patent requirements could deal a fatal blow to the industry. “In January 2016, Bangladesh’s pharmaceutical market will face difficulties, particularly with under-patent drugs (new drugs invented after 1996),” Sayedur Rahman, professor of pharmacology at the country’s renowned Sheikh Mujib Medical University (BSMMU) in Dhaka, told IPS. “Initially, those patent holders may not claim royalty, but after some time they will definitely enter our market to sell their products, employ distributors or claim royalty from the local manufacturers. “Failure to negotiate with patent holders may lead to removal of the drug from the market as well as delayed entry of new drugs,” he added. “(TRIPS regulations) will not affect ‘out of patent’ or older drugs (drugs innovated 20 years ago), which can be sold at the same price even after 2016. Ninety percent of our patients can be treated optimally with these old drugs, though this will require some rationalisation of the present prescribing trend,” Rahman added. However, the expiration of patent exemptions in 2016 could also be a moment for Bangladesh enter a gap in the international market that was hitherto filled by cheap drugs produced in India. According to BAPI’s Muktadhir, “The global generic market is finding new growth pathways as more and more products face patent expiry. (A vast majority of countries) are now dependent on the supply of Indian generic drugs and they are seriously looking for an alternative source with a similar industry standard. “BAPI is trying to develop the (local) industry to meet this gap in the international market,” he said. Nasser Shahrear Zahedee, owner of Radiant Pharmaceuticals, described Bangladesh’s current export scenario as a “warm-up phase”.